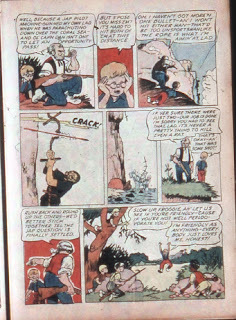 In the next page, we're in a completely different scene, with Froggy telling the other kids: "So I showed the cap'n how to aim it an' told him the exact pusychological [sic] time to fire an' -". The implication is clear (the Captain shot the Japanese while they were trying to escape), but the transition is a bit too sudden. The episode as reprinted in this volume is only 11 pages long, while the two previous episodes and the very next episode have 12 pages each. My first thought was that Fantagraphics may have accidentally skipped a page, but a likelier explanation could be that Kelly's editors decided to drop the page in which we see the Japanese soldiers being shot, figuring that such a thing might have been too strong for a children's comic, war or no war. So there you have it, the original page in its uncensored glory. Hopefully this will be included in future printings of Fantagraphics's series.